After wanting to try this foundation for so long I finally caved about a month ago and bought it. Like many others, I absolutely love this foundation. It has become my favorite light coverage foundation. I have three types of foundation favorites: a long wearing one (MAC’s Pro Longwear), my “going out” foundation that looks great in flash photos (NARS Sheer Glow, has no SPF), and my anytime foundation (Vitalumiere). Formula: This foundation is watery. You have to shake it well before applying it. Once you squirt it out the consistency is mostly liquid but also a little mousse-like. Coverage: The coverage is very sheer. If you just want to cover redness and not any serious acne then this foundation is great for you. It looks very natural. To me the finish is satin/semi matte. Longevity: This foundation lasts a long time on me, although that is subject to a person’s skin type. I have normal skin so I typically don’t have a problem with fading foundation. I either don’t set it with powder or just do so on the T-Zone because the foundation sets on its own. Scent: It smells really strong and floral while you apply it. I wish it didn’t have the fragrance, but it doesn’t irritate my skin and I don’t notice it after I’m done applying. Shade: I use B30 Sable. The B’s are yellow based and the BR’s are pink based. I was going to get B40 but I’m glad I didn’t. All my other foundations are more suitable for summer or when I’m more tan. This is my “winter”/palest shade. The coverage is really light though, you can get away with a shade darker or lighter easily. The only thing I own that I can compare it to is MAC’s Face and Body (with the exception of the finish). Both are very watery and sheer. I like Vitalumiere better because the dewy finish of Face and Body makes it transfer easily and fade quicker. I recommend it if: you like sheer coverage, you dislike dewy finishes, you’re looking for a very natural looking foundation. 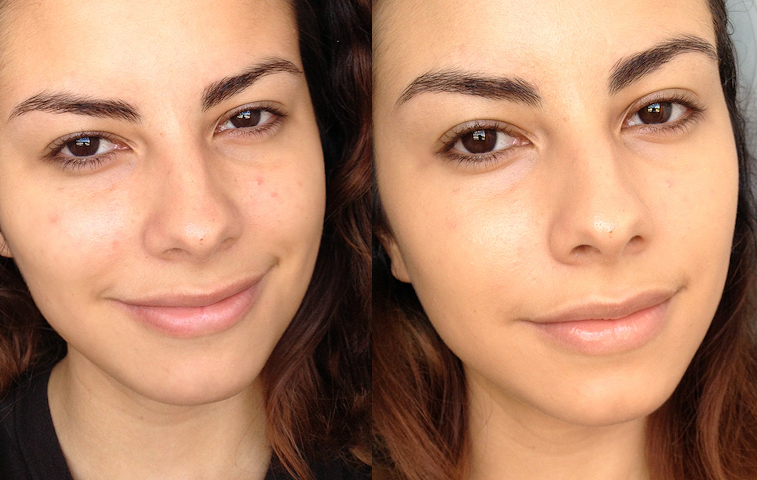 As you can see the coverage is quite sheer, I would still apply concealer over blemishes and under my eyes. Overall, it’s an excellent foundation. The only thing I don’t like is that it’s expensive and since it’s really sheer you have to use more. I can see myself running out of this quickly. I don’t think I would repurchase it simply because it’s so pricey. Ooh this is interesting, I wanted this because I thought it was dewy – but if not, back to the drawing board haha! I feel the same. It's lovely, but it runs out very quickly just by how much I have to use! Thanks for your honest opinion! Love how sheer it is, thats a definitely a plus to me. I don't like the scent though, scented products always make me have hives! It suits very good tho I would not buy it since I need more coverage. Also I think it gives you a pretty awake finish, I dont know how to say it.. it makes you look pretty fresh and glowy! This foundation looks lovely on you, very natural and glowy. I've been wanting to try this foundation for a while but i don't like light weight/Coverage foundations so i didn't get it but it looks amazing on your skin , but let's be honest you have perfect skin to begin with haha 🙂 ! i still think i will give this a try , see if i like ! great review and pictures. Thanks for the brilliant review! It looks great on you, perfect coverage for the winter. I bought this foundation about a month ago and I love it SO much! It really is fantastic. I love the sort of velvety finish. And a little goes a long way! My HG foundation. I swear by it, it's perfect. I've been eyeing on a more high end sheer foundation for a while, ah I can't decide between this one and Clarin's Ever Matte. But this ons does look very lovely and natural though.